Experience the best of Pilates, Barre, Aerial, & Yoga in the heart of downtown Singapore. Upside Motion's three studios are located in the city centre of Singapore with MRT, buses and taxis just a few steps away. All our studios offer our full portfolio of classes. Explore our new studio here! Upside Motion is turning 7 this April and we are hosting an anniversary party! On this memorable occasion, we are also kickstarting CONNECT (Women) - a meaningful charity initiative to raise funds in benefit of Daughters of Tomorrow’s (DOT) mission to facilitate livelihood opportunities for underprivileged women and support them in building financially independent and resilient families. All proceeds raised from class ticket sales will be donated to the DOT. Surprise!! Let's toast to 7 incredible years and more to come. 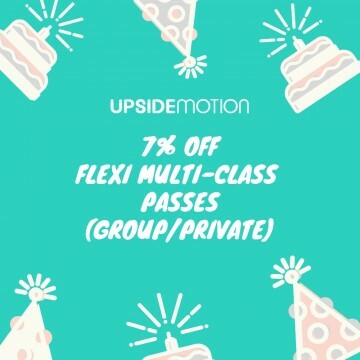 Here is our anniversary treat for you, Upsiders: Enjoy 7% Off Flexi Multi-Class Passes (Group & Private) during the month of April. Simply grab the offers online right now! *Available for purchase online and in studio. Perfect chance to sport Hello From The Upside tank and flaunt your UPSIDE vibe, stock up on your grippy sockssentials and level up your home work-out practice with Upside branded props. Promotion is valid from 1 - 30 April 2019 across three studios. Applies to: Grippy Socks, Activewear, Foam Roller, Yoga Block, Signature Mat, Yoga Mat, Dumbbells, Lacrosse Balls. Have you always been dreamed of becoming a Barre instructor? We are looking for Xtend Barre Superstars to join our Upside Motion team! Established by world-renowned Pilates teacher Rael Isacowitz, BASI Pilates® has been a leading Pilates education academy for over 25 years. Upside Motion is hosting our second year of BASI training in August 2019! Explore movement as a pathway to greater ease and healing in the body through our portfolio of fitness programmes — Pilates, Xtend Barre, Aerial, and Yoga. Free yourself from the limits of gravity and fly with an evolutionary new fitness approach to help you stretch, strengthen and tone. This highly addictive barre workout combines ballet and Pilates techniques into a fast-paced cardio activity that targets small muscle groups. Pilates places emphasis on body alignment, core exercises and breathing techniques to build strength, control and flexibility. We offer both Pilates Mat and Reformer classes. New to Upside Motion? It’s easy to get started! Start by creating a new account with us here. Have an account with us? Purchase class passes to our core group and private sessions. Discover all our classes online. Download our App for Android or iPhone to access credits, manage class booking schedule & read our client reviews! Jennifer and Dirra finished first and second respectively in our 19Before19 Festive Challenge last month. Get inspired by what motivates them and how they keep their work-out-life- balance to help us set the tone for our New Year fitness goals! We've put together 9 moves you can do for 15 minutes at home, or take with you while on vacay! Perk Of The Month: Share Your Upside Story On Google! We turn 7 this month! Share your Upside's story on GOOGLE review, spread the Upside love and earn 200 Upside Points! 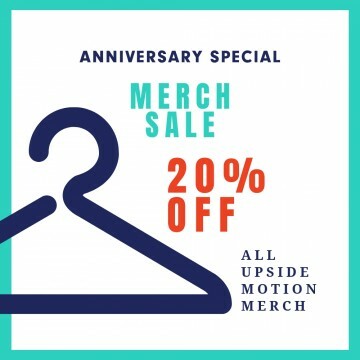 Upside Motion is turning 7 this April and we are hosting an anniversary party! Make a date with us on Saturday, 13th April 2019 at Upside Motion Shenton to celebrate! Join us at CONNECT (Women) charity classes, lululemon and Crème Simon pop-ups, #MyUpsideLife sure-win lucky dip, and fine canapé and organic artisan tea!